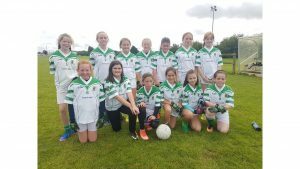 Rathangan was the host venue for the opening match of our U11 League campaign last Saturday morning at 10:30am and except for a passing shower before the match, the weather was fine and dry for the game. Both teams showed great determination to get on the ball from the start with high fielding, evasion, tackling and blocking being some of the excellent skills on display. It was great to see such large numbers of supporters out for both teams encouraging the players on and creating a very friendly and positive atmosphere throughout the game. Well done to all involved!